Two papers present ISEAA research at the Society for American Archaeology (SAA) meeting in Vancouver March 30-April 2. Joyce White (with co-author Elizabeth Hamilton) is presenting “Applying a Life History Framework to Analyzing the Ban Chiang Metals Assemblage” 8 AM Saturday April 1. Fabian Toro (with co-authors Chantel White and Joyce White) is presenting “Developing a Legacy Collection of Traditional Rice Cultivation: Implications for Archaeobotanical Study” Thursday at 10:30. This paper is a study of the ethnobotanical rice collection Joyce White made in 1980 while living in Ban Chiang village for her dissertation research. The study was conducted under the auspices of the Center for the Analysis of Archaeological Materials (CAAM) at Penn Museum. 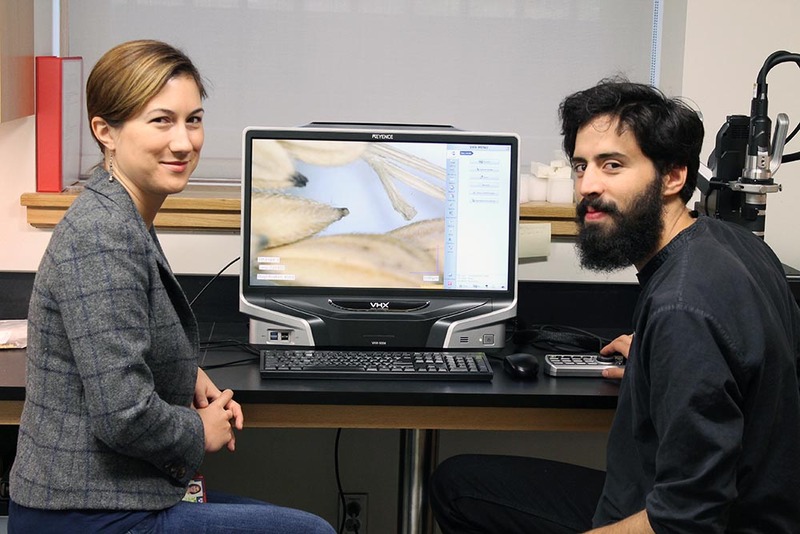 Chantel White and Fabian Toro with close-up image of rice on the Keyence microscope in a CAAM lab at the Penn Museum.